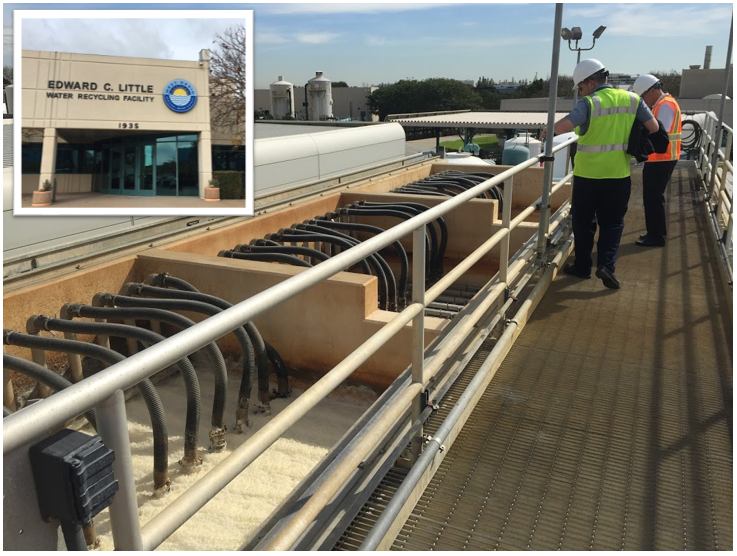 NEW YORK – May 19, 2017 After extensive pilot testing and full scale demonstration, West Basin Municipal Water District (“West Basin”) located in Carson, CA has awarded Scinor Water America, LLC (“Scinor”) a contract for full replacement of the existing submerged polypropylene microfiltration membranes within its Edward C. Little Water Recycling Facility (“ECLWRF”) located in El Segundo, CA. Due to significantly reduced capacity, high operational costs and short service life, West Basin evaluated alternatives for its submerged polypropylene system for several years. On-site testing confirmed the Scinor TIPS PVDF hollow-fiber membranes operated well on the challenging source water while producing up to 40% more product water under the same operating conditions, thereby substantially easing the capacity limitations currently experienced by the District enabling them to fulfil their continuing contractual obligations to their customers. The TIPS (Thermally-Induced Phase Separation) manufacturing process utilized by Scinor is unique in that it produces a membrane barrier with exceptional permeability, oxidant tolerance and durability. The installation is expected to be completed in the second half of 2017 and will be Scinor’s largest in the US and third largest globally. “This is a landmark achievement for our team in the U.S. and a critical step in our company’s growth”, stated Scinor Water founder and CEO Ms. Hongmei Wu. “We are honored to service West Basin, a recognized leader in adopting cutting-edge technology and water recycling standards, and to provide a much-needed solution to their short and long-term water production needs. This project will serve as an example for other prospective customers experiencing similar issues”. Membrane treatment consultants Separation Processes, Inc (SPI) and contract operations firm SUEZ are key players in the project which includes converting the current system from polypropylene to PVDF operating conditions and well as implementing automation and controls capabilities that are in line with today’s standards. ECLWRF has undergone multiple phased expansions over the last 20 years to keep up with demand. The plant employs an advanced treatment train for potable reuse, treating municipal secondary wastewater effluent from the City of Los Angeles’ Hyperion Wastewater Treatment Plant through ozonation, ultrafiltration, reverse osmosis, UV/AOP and disinfection before being used for both barrier protection and industrial process makeup water. West Basin’s 2006 expansion included installing 2,500 submerged polypropylene filtration modules supplied by another manufacturer. Originally designed to produce an average capacity of 14 MGD, actual production has been reduced by approx. 50%. West Basin, a water wholesaler of imported and recycled water, is located in coastal Los Angeles County and serves approximately 1 million people in 17 cities along with several large industrial refinery clients. Over the past twenty years, the District has continued to decrease its reliance on imported water and has relied more heavily on wastewater recycling, necessitating the need for advanced membrane filtration technology to produce the quality required for their customers. To date, the District has conserved over 165 billion gallons of potable water through their recycled water initiatives. As a result, the District has become an industry leader due to their success in creating five types of fit-for-purpose recycled water, easing demand on the scarce local water supply, environmental protection of coastal groundwater reservoirs against seawater intrusion and reducing energy associated with importing water.